4. Click on generate link… Wait for it to load, then look below it and click where you see download now. Please don’t forget to comment!! There’s been a tense competition between smartphone manufacturers in the megapixel spec race to prove that their camera is better than their rivals. We have reached a point where even the cheap and lower-end camera smartphones are packing more pixels than they should. This has made it hard to differentiate between the camera hardware. range of megapixels it supports. be only helpful for cropping. What I’m saying is that a smartphone taking images of 12 megapixels can be cropped by approximately 50 percent and its resolution will still be as high as a 4K TV. Here are some factors to consider if you want the best of the best out of your camera. intensity gathering properties of your camera’s sensor. This is a bit easy to understand. A large sensor has more area for light to penetrate giving a greater capability to gather the light. is simply because the M8’s pixels are a obviously larger and can capture more light. In summary , a camera with a high pixel size tends to capture more light than that with a lower pixel size. small number produces a better image than a larger one. picture. You should keep in mind that a smaller number means a wider aperture. camera. However, OIS ensure that the sensor remains steady even if the rest of your smartphone shakes. costly and takes up the previous space, hence it is not included in many smartphones . Instead, most smartphones use EIS to try and achieve the same effect. EIS works by stretching, cropping, and changing perspective on individual frames which make up a video. In general, it is much better to have a camera that is running OIS since stretching and cropping can reduce quality or create a ‘Jello effect ’ in videos. There’s nothing worse than when your phone memory is full and you don’t know what to delete especially when you don’t have any SD card. a new generation of smartphones, aspects such as the camera, video quality, apps, and file sizes has increased dramatically. Here are a few ways that can help you to free up space on your Android smartphone and reclaim those valuable gigs. Some people using a 128GB Android device don’t even bother about storage capacity filling up. On the other hand, the poor souls with 16GB and 8GB internal storage tend to count every single megabyte. However, you might have noticed that even in new Smartphones with 16Gb memory , the available memory is no more than 12GB. Is there a way to get all 16GB of storage space? The answer is no because manufacturers tend to play with numbers when it comes to providing internal storage. If you are given 16GB of storage at the rate of 1000MB = 1GB, the Android system calculates the storage using binary, where 1024MB = 1GB. Moreover, there is around 2GB of internal storage space that the Android OS takes up, which is the heart of your device. Hence, there is no way to increase the total internal storage capacity to more than what you see in the Storage menu of the Settings app. 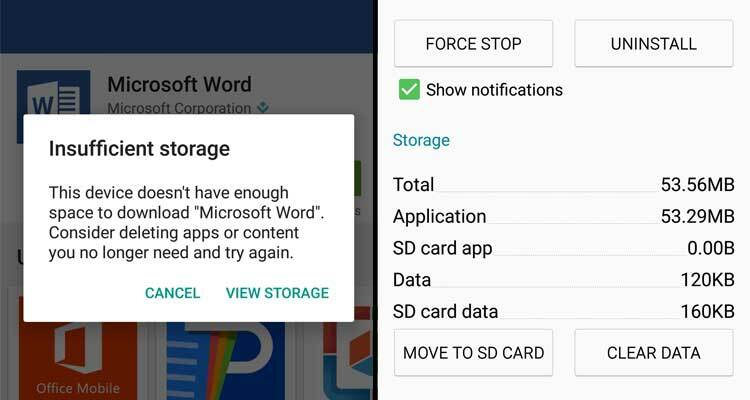 Unimportant apps could be using up a fair amount of storage space that you desperately need. For instance, Facebook and Messenger uses up almost 500MB of your device storage, which can be quite the blow on a device with low memory. You can simply switch to the Lite version of the apps which use less than 3mb. Shazam, Skype and Twitter also have Lite versions. These apps are almost useless to the user, and brands like Samsung are guilty of this. You can find the Galaxy Apps, S Health, Flipboard and many other irrelevant apps on their devices. If you aren’t too keen on removing these bloatware apps entirely by rooting your Android device, disabling them is the next best thing. Simply head over to the Applications menu in the Settings, navigate to these bloatware apps and use “Disable” to render these bloatware apps useless. I know data subscription is sometimes expensive but most times discretion is the greater part of valor. Streaming a movie will save you more storage space than downloading it. The only extra data you may use up due to streaming is due to the buffer but if your Internet speed is very good you’ll only use up the exact amount you use for downloading the movie. If you’re really concerned about your Android storage space running out, hoarding movies on your device’s internal storage won’t just take away precious space, but will slow down the system drastically. Backing up your pictures to the cloud will save a lot of storage space. To make things easier, Android OS offers an automatic backup in the Google photos app. From the Google Photos app, head over to the menu option and select “Free Up Space”. This screen will alert you on how many pictures have been backup up to your Google account and how many images can now be safely deleted. Apart from photos and videos, you can back up large documents directly to your Google Drive account and access them online, without sacrificing the internal storage space. Since a single Google account offers 15GB of free storage, you can add multiple Google accounts, back up your media content and enjoy virtually limitless space.